Im a fuel hauler and these are absolutely perfect for my application. Price was amazing too. No compliants at all and several peers have asked about them! Was everything it was said to be. Fit well and is a high quality product. Received product 3 days ahead of scheduled delivery. These are not as well made as the Key Fr Bibs. The back pockets are too shallow. The zipper is very poor quality and it doesn’t pull down far enough. The stretch portion of the straps are of a poor quality material. And the lose end just flops around instead of being tied back to the strap. The way the straps fasten to the bibs is all wrong. They should be sown to the top edge. And the way they have the strap woven into the clip causes the fastener to dig into your chest. I think it will be durable, but I’m not sure about the stretch material on the strap. 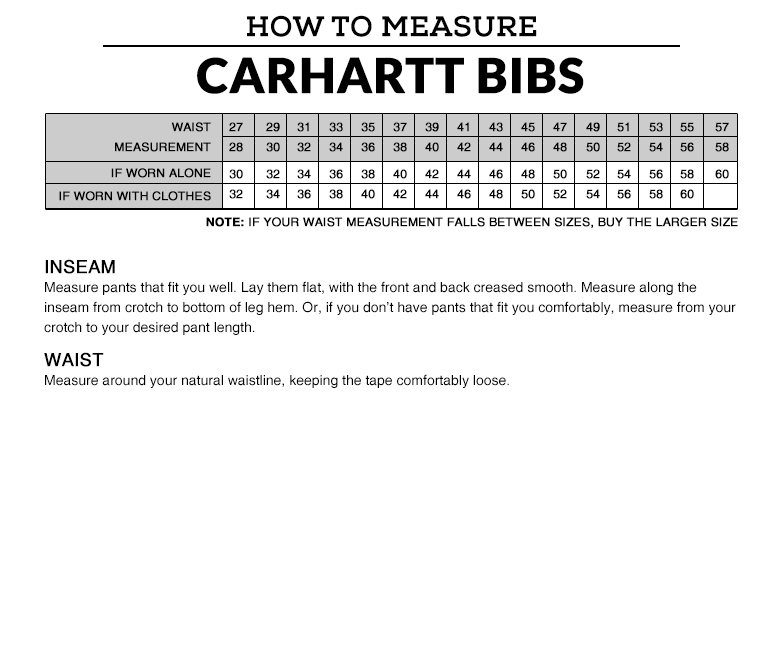 Carhartt, you are the most expensive work closes. Therefore, you should be the best. I give you a D- - - on these bibs. Shame on you Carhartt for making such an expensive yet poor quality product !!! I bought three sets of these hoping that they would last a few months. I purchased the factory seconds because the lapco jeans work complete crap and I knew Carhartt was a good brand that I had obviously used before. I wanted bibs so that my work shirt would not keep coming untucked. I work electrical Construction in substations and these bibs are amazing. The thighs and knees are super thick and do not wear out after taking a knee on concrete or Steel and give you more durability when using your thigh to clean off tools or parts. The plethora of pockets are awesome there is one wide pocket on the chest that has Velcro, a pen pocket on the chest and two smaller pockets about 4 in wide all on the chest. It has two back pockets as normal pants do, and two front pockets that are very deep. The zipper for the crotch is great as well it is a very large long zipper so if you are wearing jeans or shorts underneath it it allows plenty of space for maneuverability. 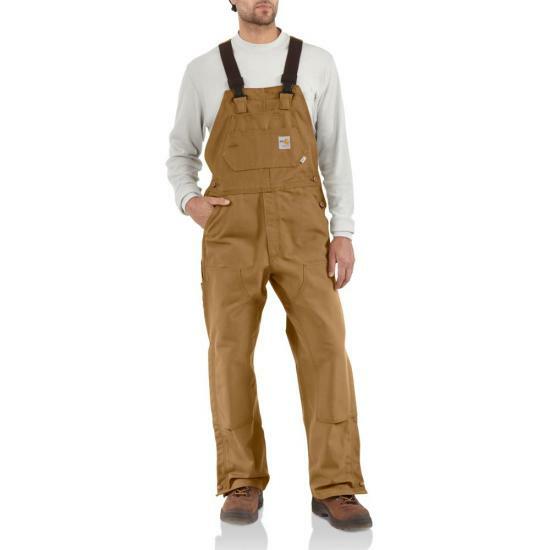 The bibs are completely flexible and all zippers work great especially the ones on the sides of the legs allowing you to get your work boots in and out easily. The only thing that I would say is a slight drawback would be that the waist size runs a little snug. And I worried that the velcro and plastic clips will wear out and or break over time. But if the bibs hold up I would just bring it into a seamstress to replace the straps with fabric and add new clips. Great product will be buying more. I work in the Oil and Gas Industry as well as volunteer as a first responder. These BIBs are made Tuff and last BUT the straps are WAY to short and do NOT give you enough room to snap them properly and still be comfortable IN THE CROTCH! As well as the hem coming loose after awhile. I am a huge carhartt fan and have been using there products since the 90's. I hope they correct the strap length which will alleviate the tight/High CROTCH. I can deal with the hem coming loose but bibs that make it tight in the CROTCH area is NOT pleasant. They need to offer embroidery! Come on carhartt! Fits true to size. I ordered the size I wear in jeans and they fit me comfortably without being to small. I couldn't find a flaw anywhere(for being factory seconds). Great quality and service ,fast shipping. I plan on returning them for another size but overall they are what I need. Got them for my son for Christmas!! He loved them. True to size. Thick, I thought they were insulated but they are not. They still keep me warm.